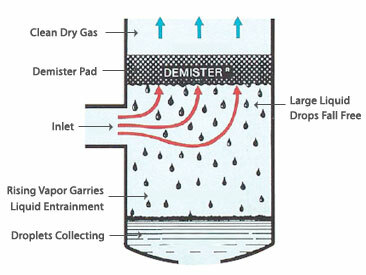 The right figure shows the operating principle of the demister working on an evaporating system. Gases which are generated from a liquid (L) are changed into bubbles (V) and these bubbles rise up. At this time, the surface of the liquid bursts and minute particles of the liquid are generated and accompanied with gases, which go through the demister. The minute particles, before going through the demister, get to have big volume due to the inertia collision principle on the surface of a pad. The particles containing foreign materials fall down due to weight and the gases or the gases containing the liquid components that have gone through the demister become pure gases that impurities are perfectly removed, and then, they go out of the demister.